The other half of this year’s potato crop. A new record for Wonder Spouse: 47 pounds total. I grew my first tomatoes when I was fifteen. I dug up a long, skinny bed beside the family carport, the only spot that got enough sun to give fruit development half a chance. I don’t remember where I got the plants. I do remember being amazed by how tall they grew. I was not prepared for that, improvising stakes from fallen sticks that littered our wooded lot. I didn’t get many tomatoes out of that effort. I’m not sure the pollinators knew where to find my pitiful plants among the massive oaks and hickories that towered around the house. 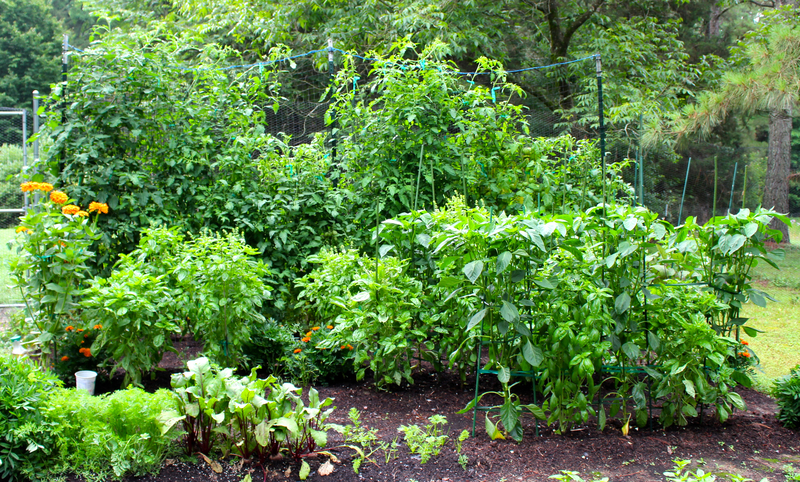 But even with all those challenges, I was hooked on growing my own food. Herb and vegetable seedlings in greenhouse on March 29. I didn’t have a chance to try it again until I was in graduate school. Some friends were renting an old farmhouse. They had turned part of an adjacent fallow field into a vegetable garden and invited me to start my own garden beside theirs. So I did. Graduate students are not often known for their healthy diets, but I ate fresh carrots, zingy peppers, and orb after orb of juicy red tomato. I even bought a pressure cooker and taught myself how to can. This was in the ancient days before youtube — no how-to videos for me. I actually read books to figure out how to grow and preserve my garden bounty. 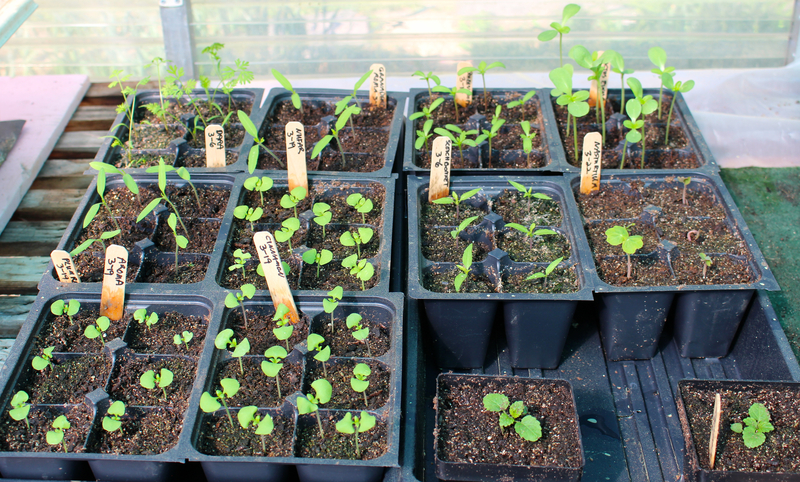 Transplanted vegetable seedlings in greenhouse on March 29. The biggest lessons I recall from that summer were about canning. First, canning in humid North Carolina in the tiny kitchen of an apartment without air conditioning is a great way to lose weight from perspiring excessively. Second, it is possible to can squash, but you really don’t want to eat canned squash; the texture is way too slimy. Canning blackberry preserves, on the other hand – totally worth the sweat equity. 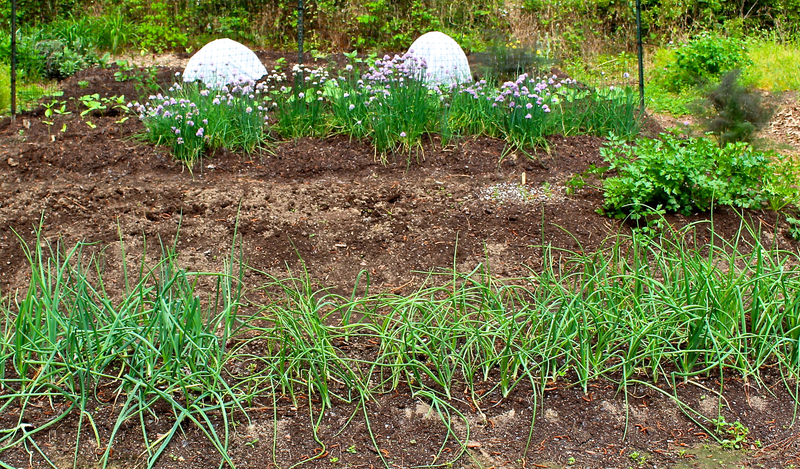 Onions, chives, and covered zucchini on May 1. I’ve grown a garden every year since then. First, in the yards of rental houses, then on the properties I’ve owned with the amazingly energetic Wonder Spouse. This year marks our 27th anniversary of growing vegetables in the same garden space. 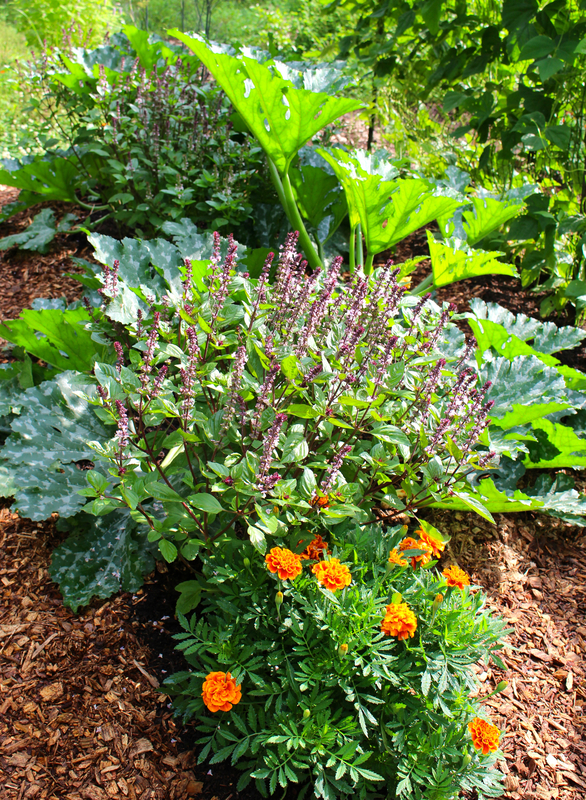 Every year, we have added compost and organic mulches to the raised beds we built. What had been pretty good soil to start with is now Vegetable Nirvana – chocolate cake soil, my sister used to call it – dark, aromatic, moist, and unlike cake – full of earthworms. Young beans and other vegetables on May 8. Once you are smitten with a love of growing your own food, soon you are not satisfied with buying plants grown by others. You spend your winters studying seed catalogs, drawing diagrams of where you will plant various crops, choosing old favorite varieties you know to be reliable, but always trying something new, something too intriguing to pass up. 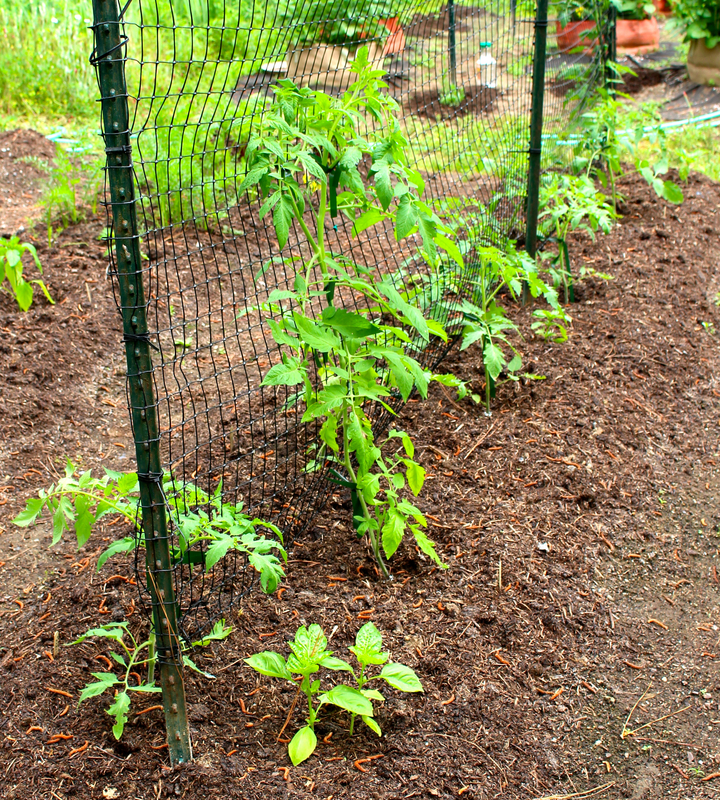 Recently transplanted tomatoes on May 1. Wonder Spouse built me a small greenhouse from a kit 22 years ago, and it is a testimony to his meticulousness that it functions as well today as it did when it was shiny and new. Before the greenhouse, we started seeds indoors, but trying to ensure that plants received adequate light was a perpetual struggle. My beautiful greenhouse solved that issue and the issue of adequately watering without overwatering – or ending up with water and soil on the living room floor. 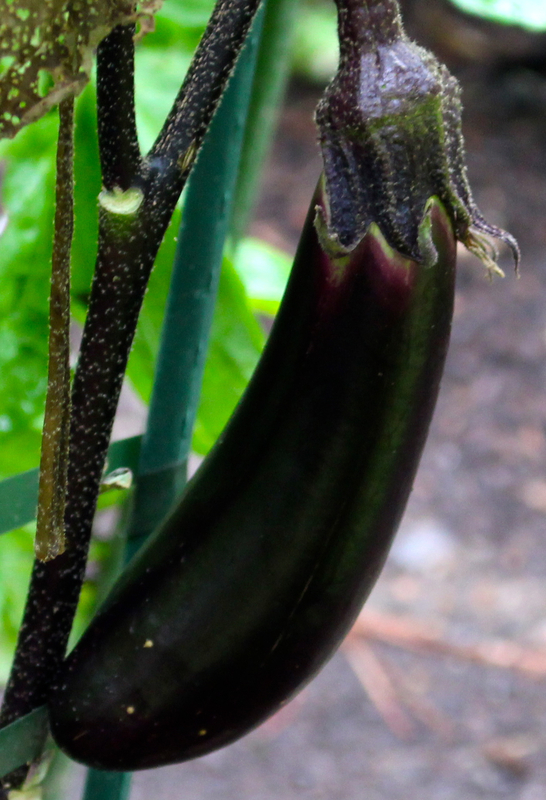 Japanese eggplant on June 22. I wish every child had the chance to grow her own food, preferably with coaching from a parent or grandparent eager to welcome a new member into the Green Thumb Clan. Too many children today don’t know where vegetables come from, and I believe the reason so many children think they hate vegetables is because they’ve never had the opportunity to taste a carrot just pulled from loamy soil, or a ripe pepper right off the bush. They don’t know what dill is, or that you can munch it like a stalk of celery. 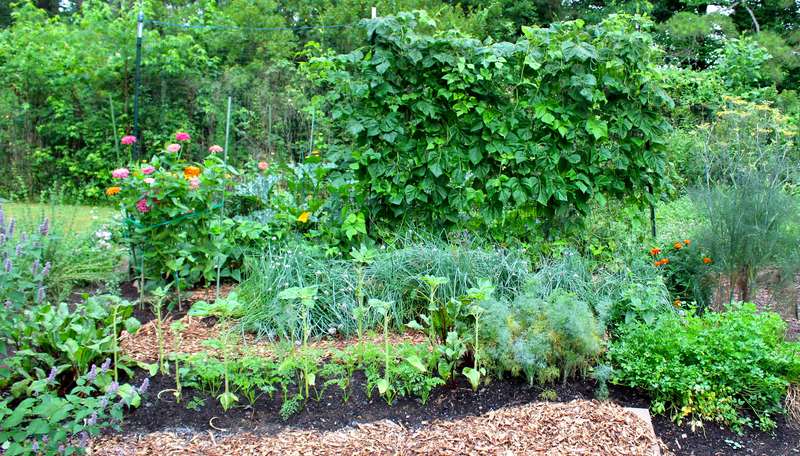 I find it heartening to see a growing number of community gardens. Some are on city lots, some on school or church properties. Folks who have had limited access to fresh vegetables and fruits are getting chances to improve their diets and get a bit of exercise in the sunshine. Beans and friends on June 22. I am also heartened by the interest of millennials in growing their own food, even adding chicken coops and honeybee hives in record numbers to urban and suburban lots. 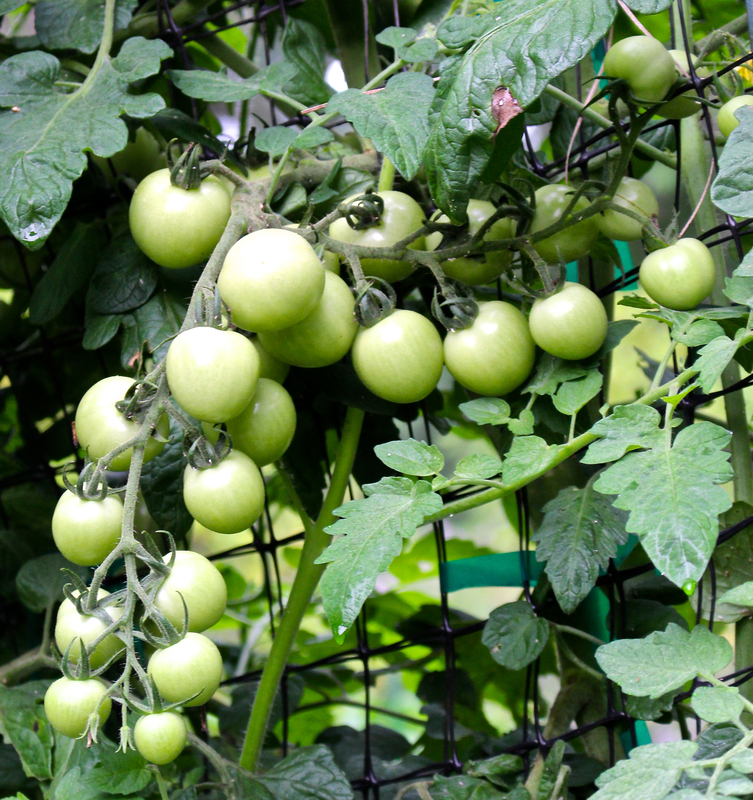 They are growing food instead of ecologically inert lawns – in their front yards! This movement is nation-wide. I am encouraged every time I peruse the Front Yardener Facebook page, where these energetic folks are figuring out how to maximize food production in their yards while making their gardens aesthetically appealing. 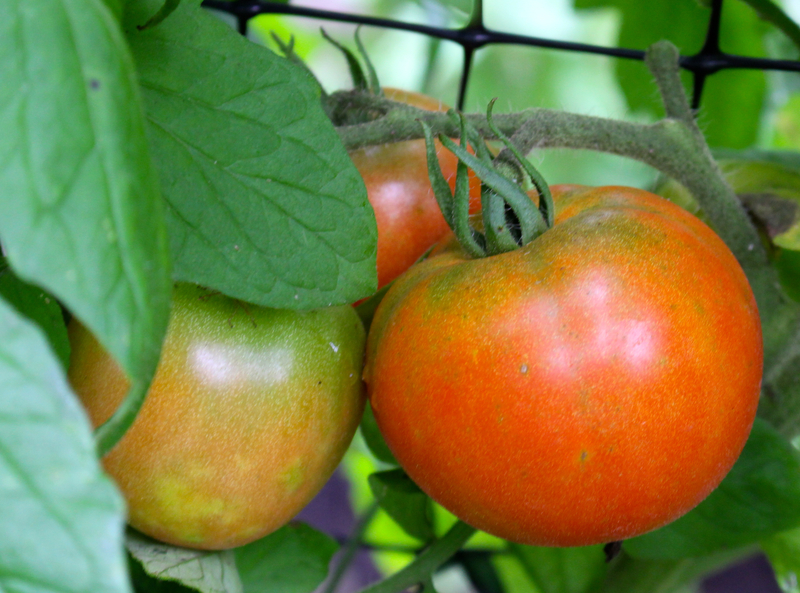 Early Blue Ribbon tomatoes on June 22. Thanks to the wonders of the Internet, these kids (sorry, you all look like children to me) are progressing far more rapidly than I did. 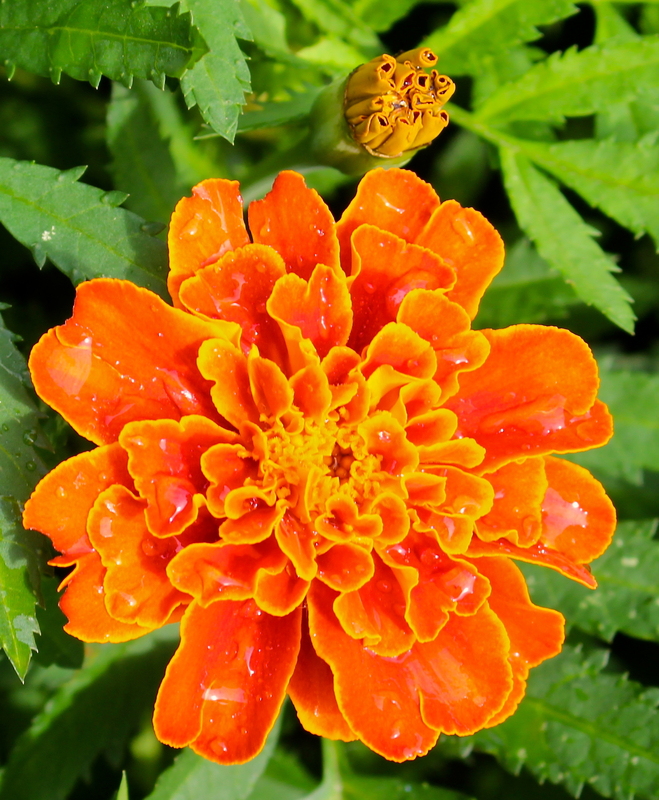 If they see a bug they don’t recognize, they go online and quickly determine whether it is a friend or enemy to their garden. 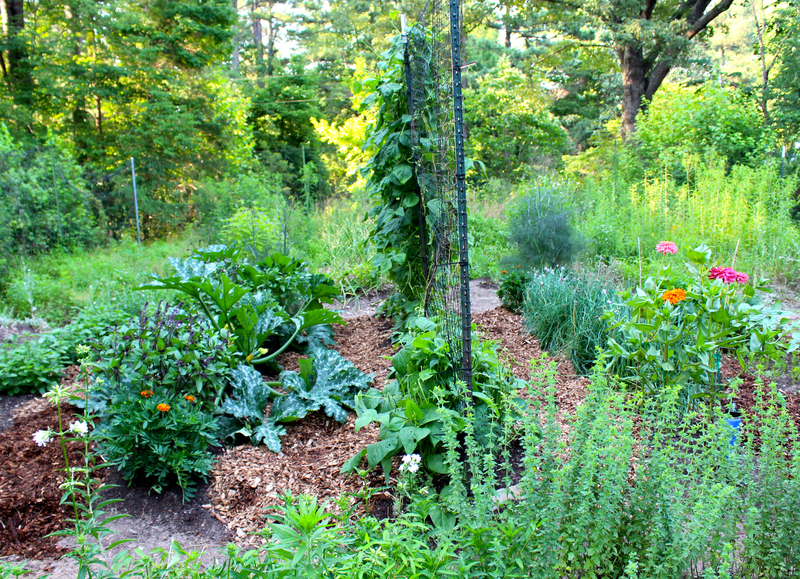 They proudly post many photos of their gardens, their harvests, and their preserved bounty. Zucchinis and friends on June 18. I know of one local neighborhood that engages in a sunflower-growing contest every summer. The household that grows the tallest flower wins accolades and admiration from all. And there’s a party, of course, to celebrate the occasion. I hope all the Front Yardeners have harvest parties where they share produce, growing tricks, and the companionship that derives from shared passions. Unripe Sweet Treats cherry tomatoes on June 22. I’m guessing they grow food for the same reasons I’ve been doing it for almost 40 years. Yes, it saves money and gives me access to foods I might not get otherwise. But as important, it keeps me outside, my hands in rich earth, my ears tuned to bird song and cicada thrumming, my eyes alert for new pollinators or potential pests. It gives me an excuse to stand at the fence to chat with my neighbor and share garden bounty. It keeps me connected to Mother Earth, the source of everything upon which we all rely. 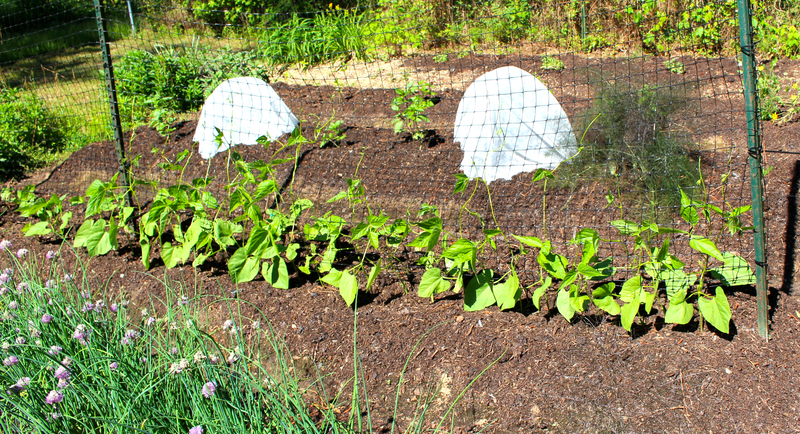 The Solanaceae quadrant: tomatoes, peppers, and eggplants interplanted with basils on June 22. For me, that will always be the bottom line – that connection to the Green World, the anchor that prevents me from being sucked into the vortex of electronic media full of talking and shouting heads and images of such cruelty that I can’t get through most newscasts these days without shedding a few tears. 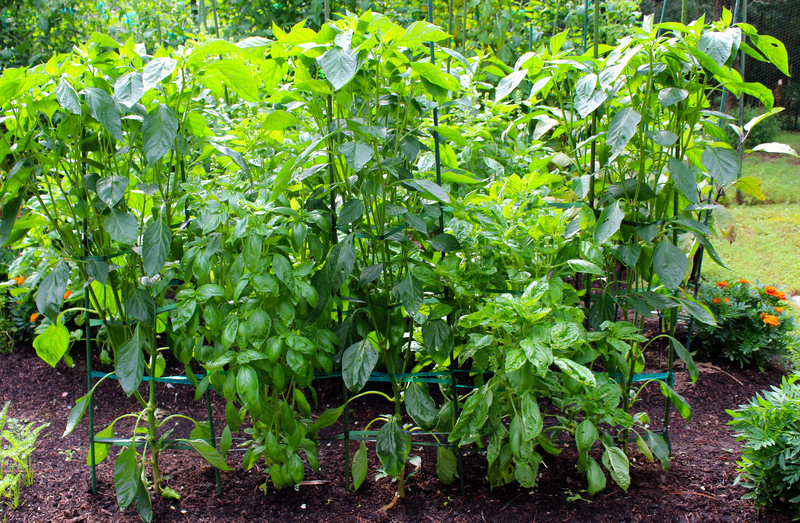 Italian peppers and basils on June 25. I grow food to remind myself of what is important, to prevent my heart from breaking, to hold on to hope. Growing food is my daily prayer for Earth and humanity. May we all find ways to nurture our hearts, our souls, and our connectedness. Queen Sophia reigns over the vegetable garden. This entry was posted on June 28, 2017, 4:19 pm and is filed under piedmont gardening, Vegetable Gardening. You can follow any responses to this entry through RSS 2.0. You can skip to the end and leave a response. Pinging is currently not allowed. I couldn’t agree with you any more – growing food is not only healthy, but also healing. It is good for the body and better for the soul. Thank you for a peek into your garden and your history. Thanks, Mary. And thanks for stopping by. Thank you, Krystal. I’m especially gratified when a representative of younger generations appreciates my offerings.